I must confess - when I step onto the moss-covered rocks and paths of the Smoky Mountains, I'm constantly on the lookout for something interesting. Usually, what stirs me the most is the way the light bathes a scene - scattered through myriad leaves, and occasionally dappling on the bank of a stream, or foliage. Finding a scene like my Autumn version of Mystic Falls - just simply never happens! When have you ever seen a deer pose so perfectly in the right spot! Never! 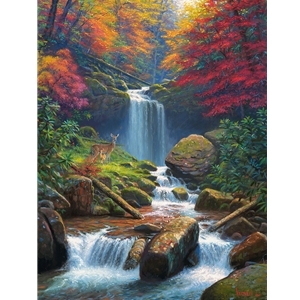 But through the magic of art, the perfect setting can be a reality - Enjoy the moment in Mystic Falls II.